From Republic Square (Namesti republiky), walk 20 metres along V Celnici street. On the right-hand side is a small square where the museum is located. The Museum of Communism (Muzeum komunismu) is the primary attraction of its kind in Prague. 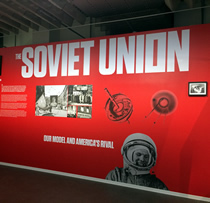 It leads visitors through the life of the Czech people in the times of the Soviet Union, covering both the good and bad aspects of the communist era. The museum has a comprehensive collection of original artefacts, including archive film and photographs, propaganda art, historical documents, statues and military objects. There is even a reconstructed school classroom, a socialist shop and a workshop. The exhibition is laid out chronologically. The historical background to the rise of communism is important, thus the story begins with the foundation of Czechoslovakia in 1918, moving on to the birth of communist ideology with Marx and Engels, the rise of the Nazis in the 1930s, the Munich agreement, occupation and liberation in the 1940s, and the communists seizing power in 1948. Naturally, the communist era, from 1948 to 1989, forms the main part of the exhibition. All aspects of the life of ordinary people are explored, as well as the political, economic and social backdrop. Visitors can find out about the ethos of the Soviet system, the total elimination of private business and collectivisation; how communist propaganda worked, and a socialist hero was depicted; and the role of the police and secret police. Learn also about the reality of life: shops that lacked basic products, including toilet paper and fruit; queues to buy everything; the limited possibilities for where people could holiday; and the role of sports. Amongst the positive stories, there was a true sense of community, and everyone had a job for life. There are sections on the cold war and emigration; listen to the stories of people who tried to escape. And learn about the political trials and the persecution. Displays also explain how the communists developed their iron, steel and mining industries, but devastated the environment. The story draws to a close with the Prague Spring, Jan Palach, the Velvet revolution, and with Vaclav Havel's ideas. Ironically, the premises the Museum of Communism occupies is modern and very spacious, a building that would never have been built under the communist system. With so many old communist sights now removed from the Prague streets, the museum stands as an authoritative historical narrative of this 20th century phenomenon.